Download "A Source Identification Scheme against DDoS Attacks in Cluster Interconnects"
2 SYN flooding attack makes as many TCP half-open connections as the victim host is limited to receive. However, the individual connection has nothing wrong except that the connection does not complete three-way handshaking. In addition to detection, we have identification problem as the second challenge. Even after detecting the occurrence of DDoS attack, it is difficult to identify originators of the attack because DDoS attacks often use spoofed IP addresses, meaning that an attacker uses a fake IP addresses instead of the real source IP address. To solve this problem, researchers have proposed several approaches including packet marking algorithms such as Probabilistic Packet Marking (PPM) and Deterministic Packet Marking (DPM) [17, 19, 20]. In PPM, each router randomly selects a packet and writes its encoded IP address. After receiving many packets marked by routers on the path, the victim can reconstruct the whole path of a DoS attack. DPM, on the other hand, marks all packets with just one bit of hash value of routers IP addresses. A series of bits marked by all intermediate routers represents a signature. Once a source or a path is identified, we can protect our system by blocking packets from that source or that path. In this paper, we attempt to solve the second challenge, the source identification of DDoS attacks, in the direct networks where two neighboring devices are communicating with a direct link. When we use existing marking algorithms in the direct networks, we find two drawbacks. First, in PPM, the overhead is proportional to the number of hops, the average of which is mostly less than 20 in the Internet. However, since the number of hops of cluster interconnects is often larger than 20, the overhead increases too much to apply PPM to cluster interconnects. Similarly, in DPM, ambiguity increases when the number of hops is longer than 16, i.e. at the point where marking bits is overwritten by other routers. Second, the previous algorithms assume that routing path is stable. However, the direct networks often use adaptive routing schemes in which routing paths are not fixed but variable depending on the current network condition. 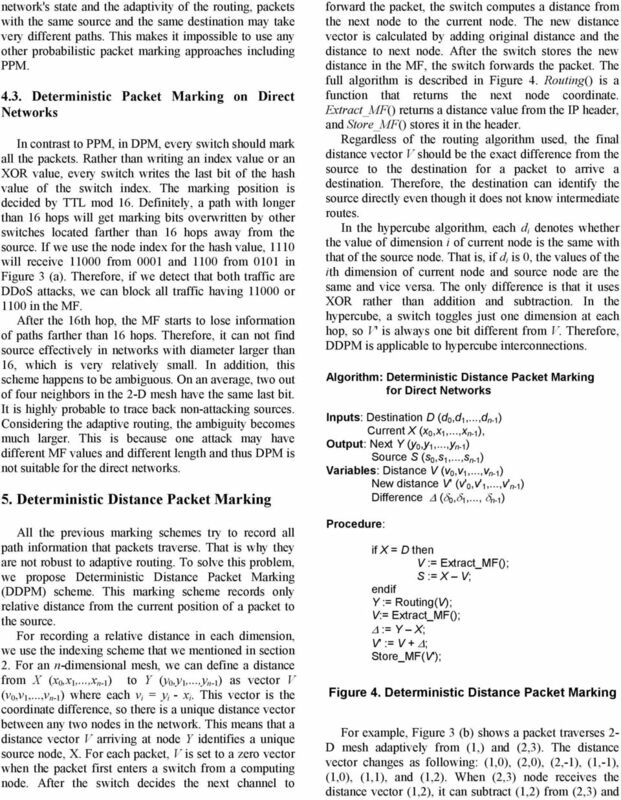 Therefore, we propose a new method, Deterministic Distance Packet Marking (DDPM), which finds a source directly without identifying paths. DDPM records only the relative distance from current position to source node. This can be easily implemented in regular networks such as Mesh, torus, and hypercube where each node is indexed by its regular topology. The victim needs only one packet to identify the source. The remainder of the paper is organized as follows: Section 2 introduces the key idea of packet marking scheme and describes the PPM and DPM. We review the interconnection networks and explain their distinct properties in section 3. In section 4, we explain basic assumptions of our approach and show how the existing packet marking algorithms can be applied in the direct networks. Section 5 describes our algorithm and shows pseudo codes. Finally we discuss our algorithm s limitation and the future research in section 6, and conclude in section Related Work Researchers have proposed various schemes against DDoS attacks in the Internet. Ferguson and Senie proposed an ingress filtering scheme which blocks all packets with bogus source addresses . This scheme is possible only when a filtering router is aware of all legitimate source addresses. It is effective to block DDoS attacks in small networks because routers are aware of all source IP addresses. However, in large networks it is impossible to have all the IP information. Burch and Cheswick proposed a controlled flooding method, which can identify the DDoS attack path by selectively flooding incoming links . Their idea is based on the fact that flooding a link DDoS traffic will change the amount of DDoS traffic noticeably. This approach is possible only during ongoing attacks. Also, it cannot find the paths when the attack traffic comes from many links. In addition, it can further worsen the situation by flooding more traffic into the already congested networks. After Burch and Cheswick noted the possibility of tracing back source nodes by packet marking, Savage was the first to fully explore the probabilistic packet marking scheme by the help of intermediate routers . The Probabilistic Packet Marking (PPM) scheme chooses a packet probabilistically at every edge and writes traceback information in the Marking Field (MF). The information consists of an edge identifier and distance from the current edge to the victim. A straightforward edge identifier can be two 32-bit IP addresses of two neighboring routers. For example, if a traffic flows through three routers, , , and , the marking information from the first edge will be ( , , 1), and the second will be ( , , 0). When the destination receives sufficient marking information, it can reconstruct the whole path of the traffic. This is very simple but two 32-bit marking information and distance field is too long to fit into the 16-bit MF. To store sufficient trace back information in the 16-bit IP identification field, they proposed an encoding scheme which hashes IP addresses and writes a fraction of it. With less packet length overhead, the expected number of packets for the victim to receive before reconstructing a path of length of d is roughly less than k ln(kd)/p(1-p) d-1, where k is the number of fraction and p is the marking probability. 4 necessary, and then forwards east, south and north adaptively. In (b), since D is located east of sources and the east links fail, packets from S1 and S2 move south first (Packets from S1 can move north first) and then move toward D until they arrive in D. In (c), since a lot of links fail, there are a few paths from sources to the destination. Note that all paths should turn west at the right side node of D. West-first routing cannot route in this situation because packets should turn west at the last turn, not first. Fully adaptive routing does not have such restrictions, so it can forward all the packets successfully as shown Figure 2 (c). S1 S2 D S1 S2 D S1 S2 (a) (b) (c) Figure 2. Routing algorithms in 2-dim mesh: (a) XY routing; (b) west-first routing; (c) fully adaptive routing. 4. Simple Marking Algorithms In this section we describe basic assumptions and present how the packet marking algorithms described above can be applied to some direct networks. 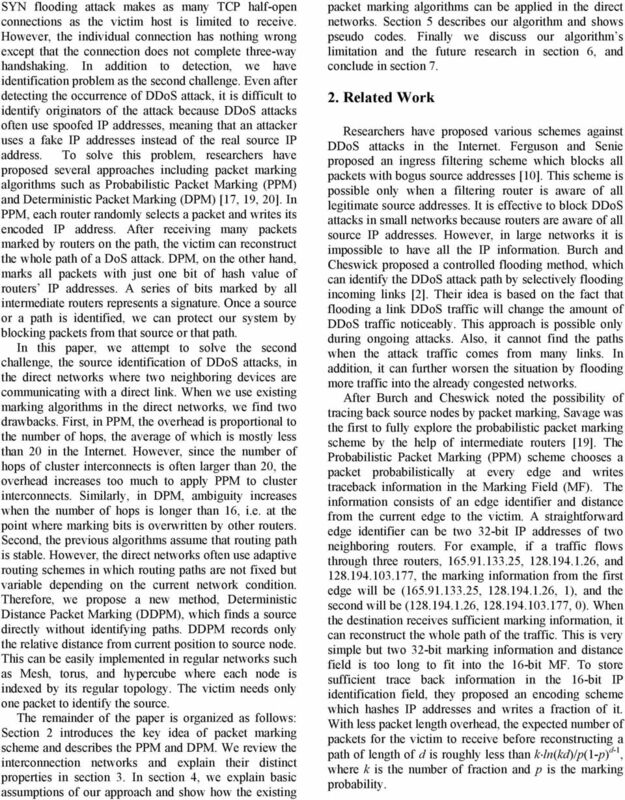 We show that because of routing adaptivity, existing marking algorithms cannot defend against DDoS attacks efficiently Basic Assumptions Before applying the packet marking algorithms to direct networks, we identify assumptions that motivate and constrain our application: - attacking traffic is generated and consumed inside direct networks, - direct networks use IP, - attackers generate packets with spoofed IP addresses, - one node consists of a switch and a computing node, but they are separate entities, - switches cannot be compromised, and - the route is not stable. D The first assumption narrows down our research scope. Since we assume that IDS or firewall can keep cluster networks safe from outside security threats, we concentrate on the inside traffic of the network. The second assumption allows us to apply packet marking algorithms in the cluster interconnects because the MF is located in the IP header. In most processorlevel interconnection networks, they don t have to use IP address. However, in many cluster-level networks, to be connected to the Internet, they should use IP address. Even though only a front-end system uses a real IP address and other systems use private IP addresses, each IP address should be unique inside the network. In addition to the IP address, these machines may have additional indexes because they are connected in a regular way. After establishing a mapping table between IP addresses and indexes, switches look for this index alone. But every packet still contains IP header. Therefore, we can feasibly use the IP header for storing marking information. For the same reason, we can assume that an attacker can spoof the IP address. Until now, we have considered the switch and computing node as one entity (Even though direct networks are router-based networks, we use switch rather than router to differentiate from the Internet router). But in a real scenario, they are separate entities. It is possible to integrate switching functions into its computing node by installing multiple Network Interface Cards (NIC). The primary issue of this interconnection is that it cannot get a high performance. For a packet to be switched, it should traverse each system s NIC. In a large cluster with a few thousand systems, total traversing distance will be at least hundreds of meters because a packet may have to traverse hundreds of systems. Alternatively, one can put together all switches in one rack, or even in a board. Such interconnection is easer to manage and has very low latency. Thus separation is more preferable and we henceforth hold that assumption. Switches provide very limited service and switches are separate from computing nodes. This makes them very less unlikely to be compromised. To prevent even the small probability of compromising switch, we should add an authentication function working on the switching layer. Before putting this function into a switch, rigorous research is required to consider a trade-off between performance and security. We will discuss more about this in the discussion section. For now, we assume switches are not compromised. Finally, a route from an attacker to a victim is not stable due to the adaptive routing. As we mentioned earlier, adaptive routings allow each packet to select the next link according to the current network state. A route is guaranteed to be stable only in deterministic routing. 7 quickly identify the source (1,1). In the hypercube in Figure 3 (c), the distance vector changes as following: (1,0,0), (1,0,1), (0,0,1), (0,1,1), (0,1,0), and (1,1,0). (0,0,0) can identify the source (1,1,0) by XORing its coordinate (0,0,0) and the distance vector (1,1,0). 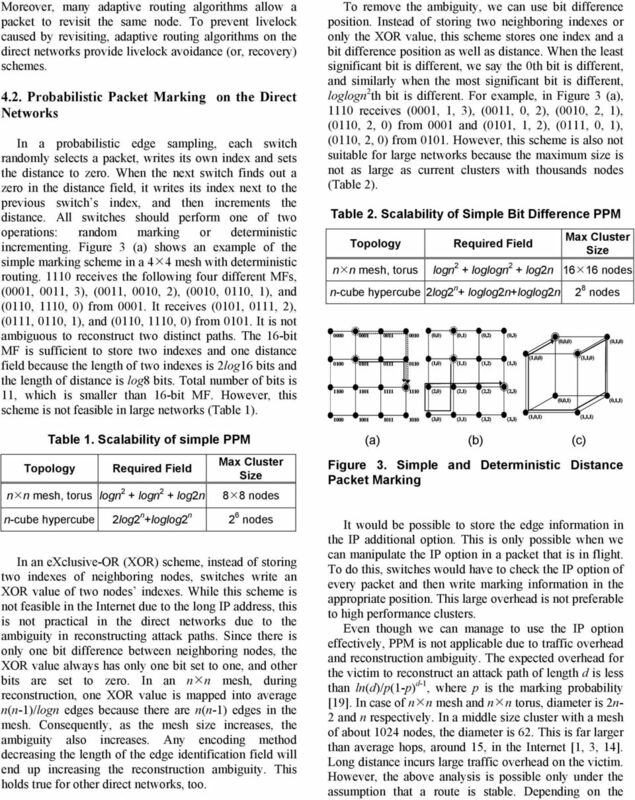 DDPM can support larger number of nodes compared to the simple marking algorithms. To support n n 2-D mesh and torus, each half of the MF contains the distance in one dimension. The distance can be negative, so half of MF can represent 2 7 nodes in one dimension. Therefore, DDPM can mark up to mesh and torus (16384 nodes cluster). For a 3-D mesh and torus, DDPM can mark nodes by splitting the MF into two five-bits and one six-bits (8192 nodes cluster). For the hypercube, the whole MF can be used for the distance vector, so DDPM can mark 16-cube hypercube (65536 nodes cluster). Table 3 summarizes these facts. Table 3. Scalability of DDPM Topology Required Field Max Cluster Size n n mesh, torus 2logn nodes n-cube hypercube log2 n 2 16 nodes 6. Discussions In this section, we discuss our algorithms limitations and future research. First, we discuss DDoS detection and its difficulties. Second, we explain the importance of research on relationship between performance and security. Finally, we describe future research on diverse cluster interconnects Detection Before identifying sources, we have to decide which traffic is malicious. That is because to identify all sources of entire traffic will be useless if we cannot differentiate malicious traffic from normal traffic. 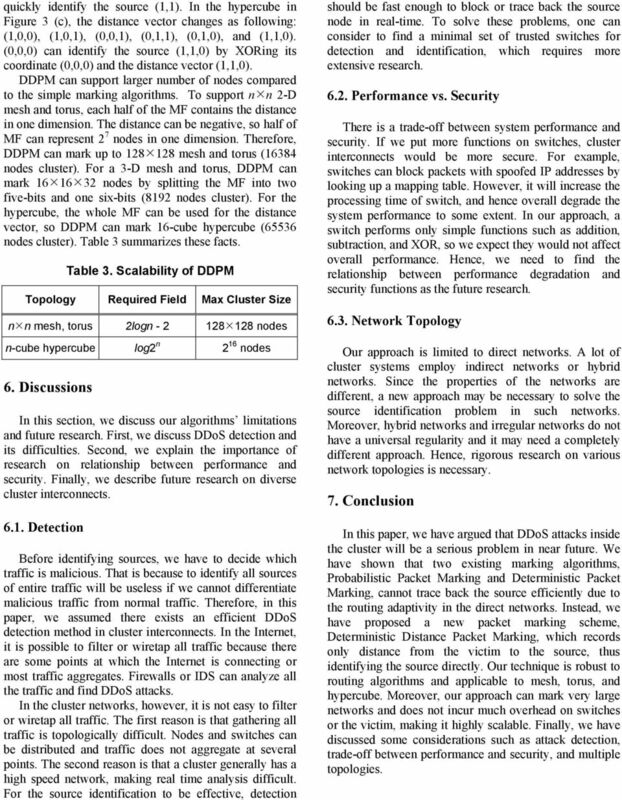 Therefore, in this paper, we assumed there exists an efficient DDoS detection method in cluster interconnects. In the Internet, it is possible to filter or wiretap all traffic because there are some points at which the Internet is connecting or most traffic aggregates. Firewalls or IDS can analyze all the traffic and find DDoS attacks. In the cluster networks, however, it is not easy to filter or wiretap all traffic. The first reason is that gathering all traffic is topologically difficult. Nodes and switches can be distributed and traffic does not aggregate at several points. The second reason is that a cluster generally has a high speed network, making real time analysis difficult. For the source identification to be effective, detection should be fast enough to block or trace back the source node in real-time. To solve these problems, one can consider to find a minimal set of trusted switches for detection and identification, which requires more extensive research Performance vs. Security There is a trade-off between system performance and security. If we put more functions on switches, cluster interconnects would be more secure. For example, switches can block packets with spoofed IP addresses by looking up a mapping table. However, it will increase the processing time of switch, and hence overall degrade the system performance to some extent. In our approach, a switch performs only simple functions such as addition, subtraction, and XOR, so we expect they would not affect overall performance. Hence, we need to find the relationship between performance degradation and security functions as the future research Network Topology Our approach is limited to direct networks. A lot of cluster systems employ indirect networks or hybrid networks. Since the properties of the networks are different, a new approach may be necessary to solve the source identification problem in such networks. Moreover, hybrid networks and irregular networks do not have a universal regularity and it may need a completely different approach. Hence, rigorous research on various network topologies is necessary. 7. 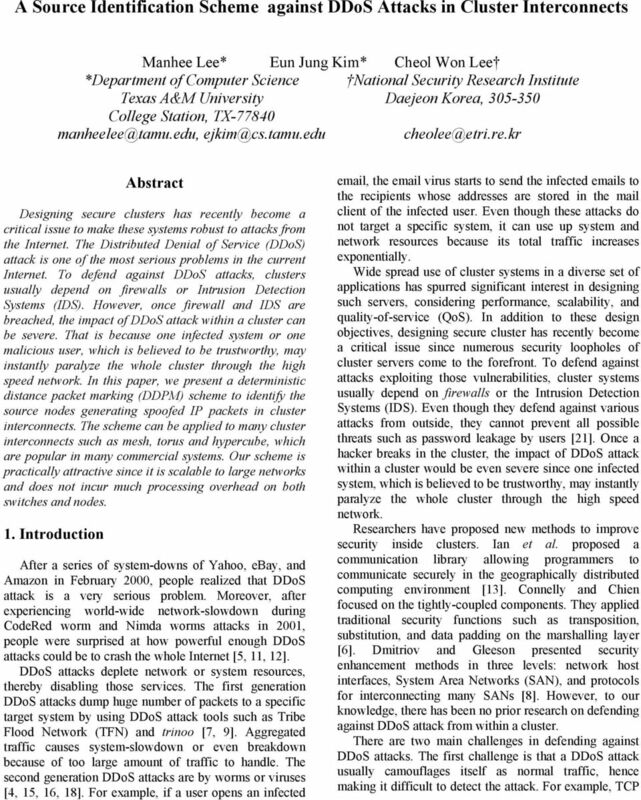 Conclusion In this paper, we have argued that DDoS attacks inside the cluster will be a serious problem in near future. 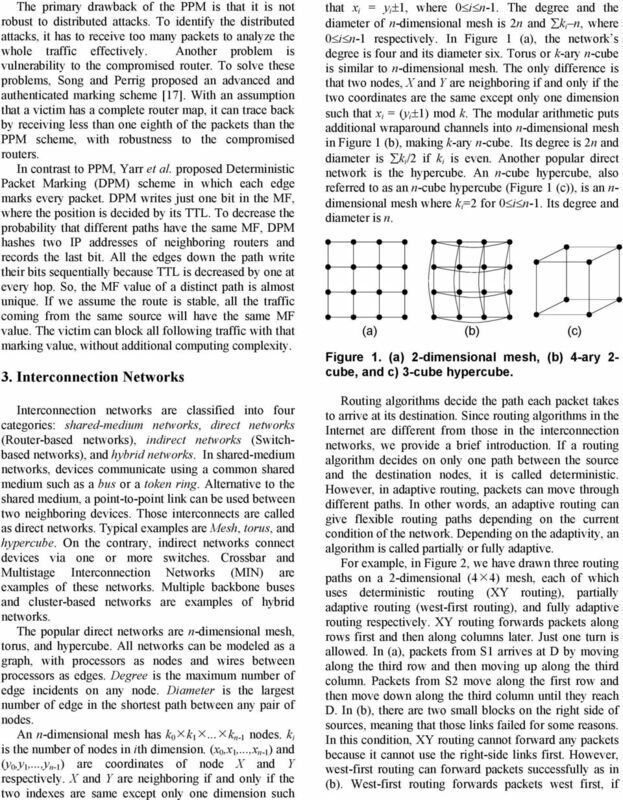 We have shown that two existing marking algorithms, Probabilistic Packet Marking and Deterministic Packet Marking, cannot trace back the source efficiently due to the routing adaptivity in the direct networks. Instead, we have proposed a new packet marking scheme, Deterministic Distance Packet Marking, which records only distance from the victim to the source, thus identifying the source directly. Our technique is robust to routing algorithms and applicable to mesh, torus, and hypercube. Moreover, our approach can mark very large networks and does not incur much overhead on switches or the victim, making it highly scalable. Finally, we have discussed some considerations such as attack detection, trade-off between performance and security, and multiple topologies. 8 8. 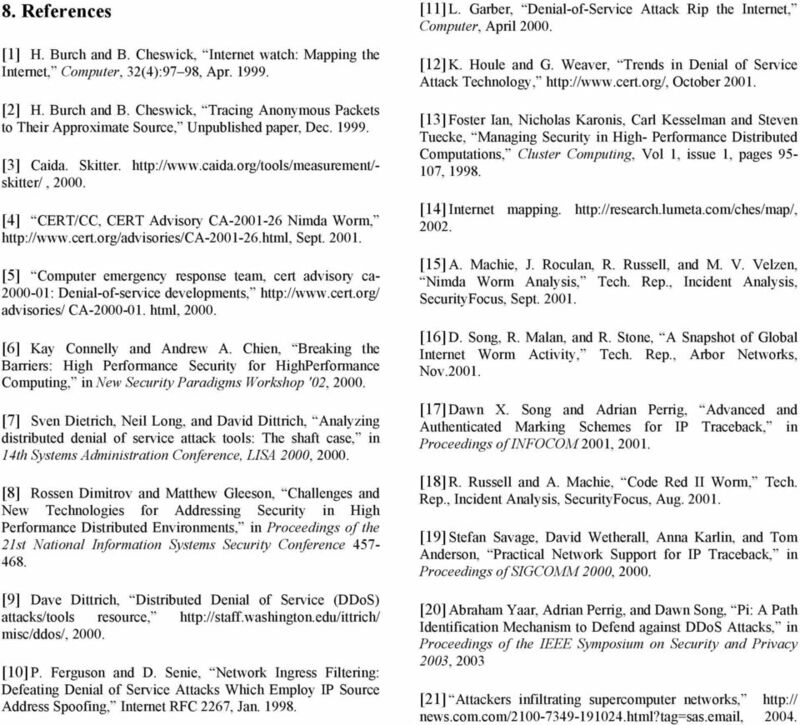 References  H. Burch and B. Cheswick, Internet watch: Mapping the Internet, Computer, 32(4):97 98, Apr  H. Burch and B. Cheswick, Tracing Anonymous Packets to Their Approximate Source, Unpublished paper, Dec  Caida. Skitter. skitter/,  CERT/CC, CERT Advisory CA Nimda Worm, Sept  Computer emergency response team, cert advisory ca : Denial-of-service developments, advisories/ CA html,  Kay Connelly and Andrew A. Chien, Breaking the Barriers: High Performance Security for HighPerformance Computing, in New Security Paradigms Workshop '02,  Sven Dietrich, Neil Long, and David Dittrich, Analyzing distributed denial of service attack tools: The shaft case, in 14th Systems Administration Conference, LISA 2000,  Rossen Dimitrov and Matthew Gleeson, Challenges and New Technologies for Addressing Security in High Performance Distributed Environments, in Proceedings of the 21st National Information Systems Security Conference  Dave Dittrich, Distributed Denial of Service (DDoS) attacks/tools resource, misc/ddos/,  P. Ferguson and D. Senie, Network Ingress Filtering: Defeating Denial of Service Attacks Which Employ IP Source Address Spoofing, Internet RFC 2267, Jan  L. Garber, Denial-of-Service Attack Rip the Internet, Computer, April  K. Houle and G. Weaver, Trends in Denial of Service Attack Technology, October  Foster Ian, Nicholas Karonis, Carl Kesselman and Steven Tuecke, Managing Security in High- Performance Distributed Computations, Cluster Computing, Vol 1, issue 1, pages ,  Internet mapping  A. Machie, J. Roculan, R. Russell, and M. V. Velzen, Nimda Worm Analysis, Tech. Rep., Incident Analysis, SecurityFocus, Sept  D. Song, R. Malan, and R. Stone, A Snapshot of Global Internet Worm Activity, Tech. Rep., Arbor Networks, Nov  Dawn X. Song and Adrian Perrig, Advanced and Authenticated Marking Schemes for IP Traceback, in Proceedings of INFOCOM 2001,  R. Russell and A. Machie, Code Red II Worm, Tech. Rep., Incident Analysis, SecurityFocus, Aug  Stefan Savage, David Wetherall, Anna Karlin, and Tom Anderson, Practical Network Support for IP Traceback, in Proceedings of SIGCOMM 2000,  Abraham Yaar, Adrian Perrig, and Dawn Song, Pi: A Path Identification Mechanism to Defend against DDoS Attacks, in Proceedings of the IEEE Symposium on Security and Privacy 2003, 2003  Attackers infiltrating supercomputer networks, news.com.com/ html?tag=sas. , 2004.